As social media came up and video tapes and dvd’s disappeared it’s become harder to make a legitimate career as a skateboard filmer. And photographer for that matter when there’s kids with crazy cameras ready to work for free. But it is still possible and Jenkem talked to a few of the homies that do. This one’s just as important to understand if you’re a skater so you know what the filmers are going through. Can you sell clips you filmed on your camera phone? Social media is really tough to get paid for. A lot of time sponsors will repost whatever you put on Instagram, thinking it’s fair game, but in all reality they should be paying you to use your content as an advertisement on their page. Usually if you hit them up about it they tell you that they don’t have the budget for that kind of stuff. “I’VE NEVER GOTTEN PAID FOR ANYTHING ON INSTAGRAM.” If social media is your best form of marketing then you should have a budget to pay the people that are contributing to your brand’s marketing scheme on Instagram. 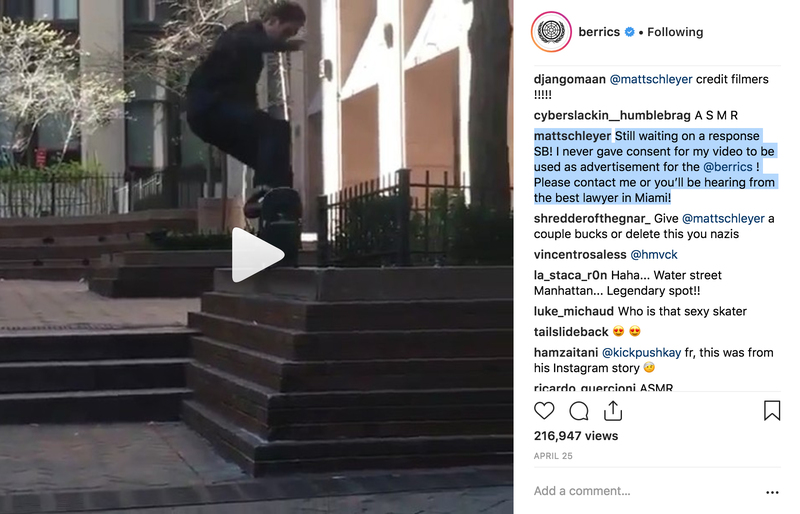 The Berrics has been going social media crazy to try to continue to draw attention to themselves. They continually repost other people’s content without asking, and they have no plan to pay the people they are stealing the videos from. They have used my videos without permission and would not take them down after I asked. One of those videos was at Pyramid Ledges, and I still can’t figure out how my video relates to their indoor skatepark. Still waiting on my checks, Berra! I got unpaid invoices dating back to 2016 for projects done with you guys! But I’m not the only one. Unfortunately many other photographers and filmers are in the same boat as me when it comes to getting paid from them.